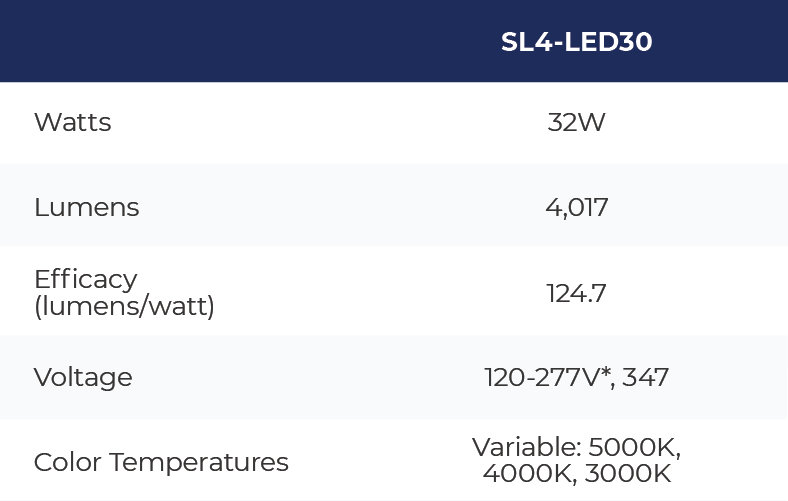 SL4-LED Strip Light - Efficient & Easy to Install - RAB Design Lighting Inc.
With a frosted linear lens, this LED strip light provides uniform light distribution ideal for use in shops, coves, and general area lighting! RAB Design’s sleek new SL4-LED30 strip light features variable colour temperature settings! Choose between 3K, 4K, or 5K while installing by using the switch inside the fixture’s housing. • Can be surface or suspended mounted. Choose your colour temperature easily – just toggle the switch under the lens. The SL4 has a slim profile with a rounded curved lens giving it a clean, sleek look. With conduit knockouts, keyholes, easy connector plates, the fixture can easily be surface or suspended mounted. Easy to use linking connector plate. Connect up to 25 fixtures in a row with the easy mounting tab for seamless fit. Steel plates slide in seamlessly for continuous row applications. Optional wings accessory – distribute light in a more condensed pattern. **Colour temperature is variable and can be changed on the fixture with a switch. Light output varies according to the colour temperature selected as seen in above table. **Colour temperature is variable and can be changed on the fixture with a switch. Light output varies according to the colour temperature selected as seen in above table.